One of the things that my husband and I bonded over as we were dating and still well into our marriage is Pokemon. This silly tv show about collecting and evolving creatures has become a constant featured fandom in our lives. However, this is one of the only fandoms that is not displayed in some form on the walls of our house. This Christmas, the Husband changed that. On Christmas Eve he and I opened our presents. I had be a bit naughty and snooped a little (only feeling the presents to see if I could guess what it was), and there were four packages that were all the same size and they felt like frames. This is weird because my husband detests photos, so I knew they weren’t of us but I couldn’t decide on what they could be. After ripping open the presents I could not help but giggle. He had found a Reddit Topic about a guy who quit his day job to paint derpy Pokemon and sell them on the internet. After looking through his selection, the Husband decided that it was something that needed to be on our walls. hear’s a story about a little Squirtless that lives in a derp world. Ugh. Like, this is Sassymander. It’s this thing we painted with, whatever. OK? I guess it looks good on walls and such, but Sassymander is totally like, literally the best one of the 4 starters. Pumpkin Spice Lattes. A WILD DERPASUAR APPEARED! 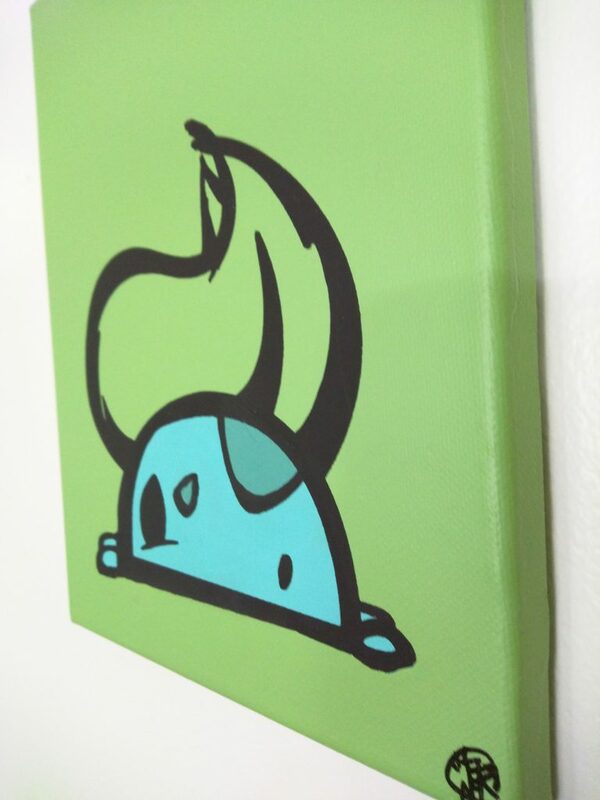 Derpasaur is one of our favourite designs from its simple shapes and bright green colour. 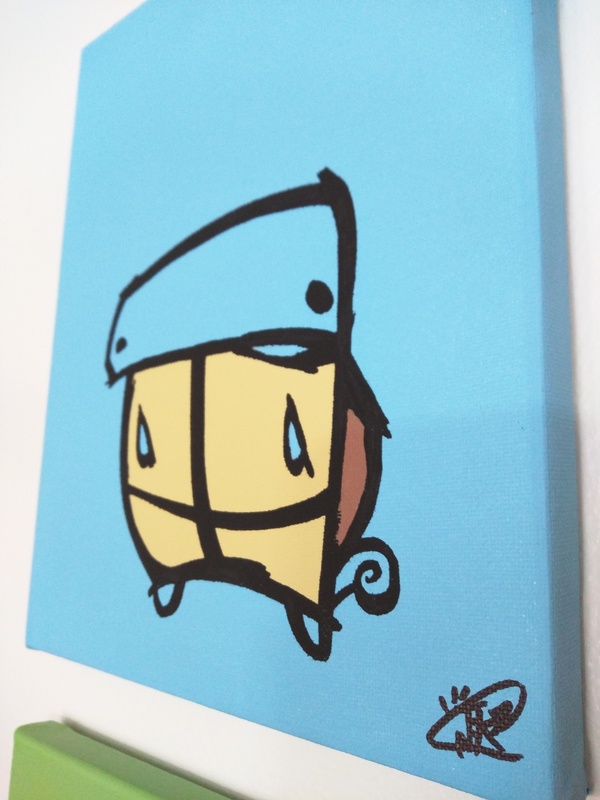 When paired with our other “starter” canvases, you will see a rainbow of colour and personality on your wall! Meet Kachoo! 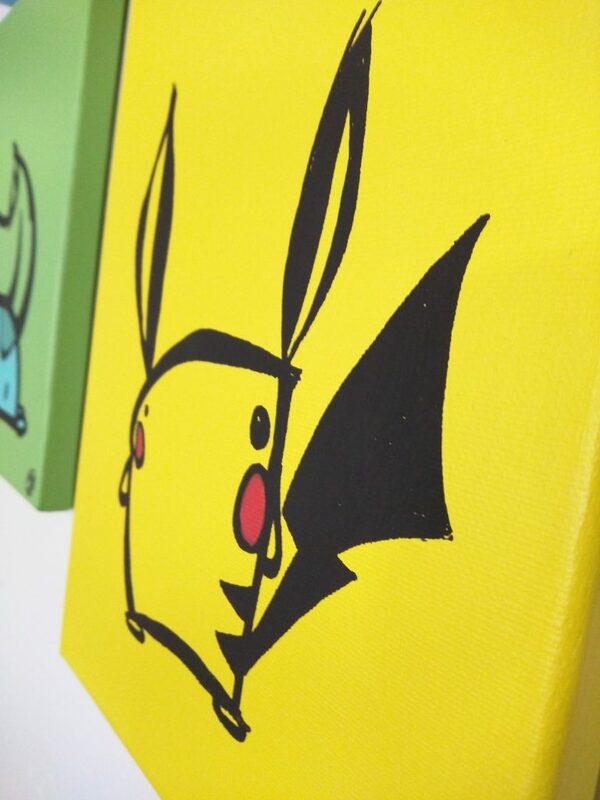 he is a 8″ x 10″ hand painted, acrylic latex, sharpie, and ink mixed medium painting on canvas. 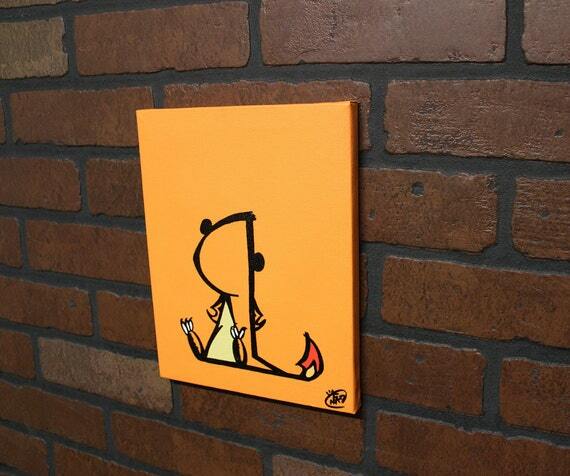 He loves bringing life to walls, whether it be the work office, bedroom, living room, or game room! Each of these are not only amazing, but made even more so when you realize they are each hand painted. I’m incredibly impressed with the quality of the artwork and variety that they are currently offering. 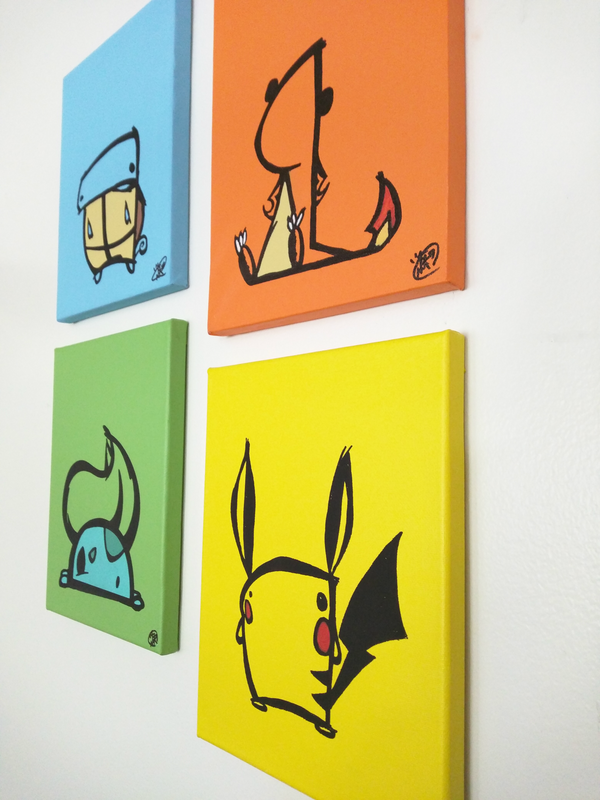 In addition to the hand-painted canvas, Rawry and Pohly also offer prints as a much more cost effective option but just as beautiful (seriously, those Eeveelutions are adorable!) They are also coming up with more and more designs and previewing them at conventions and on their social media pages. As soon as we get our basement finished I will be investing in more of these! I’d love to eventually get the evolution sets of the three original starters… and the Eevee-lution set… and basically all of them. 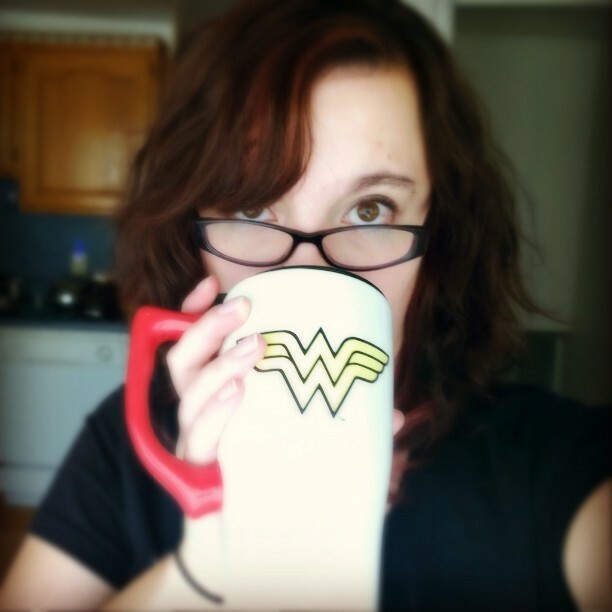 Who are some nerdy artists you’ve found lately?